I pray that I am open to God’s revelation of His purpose in my job/career. I pray that I am hopeful, and not cynical or bitter. I pray that God removes all the barriers in my life and my heart that keep Him from moving powerfully in my life. I pray that I will rest in the Lord’s promises for me. I pray that I will focus on relationships and loving people. I pray that God continually transforms my character each day. I pray that I can see God’s miracles in each moment. And I pray that when I re-visit this list next January, I am astounded by the work of the Lord in my life and by what He has done through me during one short year. Because His work in me during the past 12 months has been nothing short of miraculous, my prayers are bigger and bolder this year. Because I know He has designed me to dream big and to place my hope and faith in Him. May you be blessed with a prayerful start to this year! P.S. 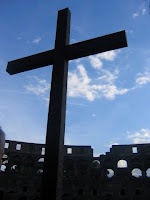 I took the photo above at the Colosseum in Rome, Italy in November 2006. Love this. I love that our Lord has such big plans for us and that you’re praying and hoping boldly. Thanks for writing this. You’re such an encouragement.